Time to help Cayde-6 kill a bunch of imprisoned aliens who still have their weapons. Forsaken is the next piece of paid-DLC coming to Destiny 2 on September 4th, and as part of our on-going Destiny 2 coverage, I talked my way into a campaign hands-on of the first mission, Prison Break. This mission sets the pace and tone of what will follow, and although only the first half of the mission was available, it gave a good taste of what’s on offer. The demo opened with a brief description of events that have led to this event, presumably taking the place of a cinematic. Fighting between alien species has broken out in the Reef’s prison, so Petra Venj has request Cayde-6 to help quell the uprising, and he’s brought along his most trustworthy Guardian – me (or you, I suppose). I’m dropped immediately into a cavernous prison, where all the inmates are armed to the teeth and shooting one another from various tiers and balconies lining the walls. It’s a massive firefight, as Colossi attack groups of Dregs, while Vandals take potshots from their advantageous position. After a few minutes of shooting, the room is clear and I’m racing off to the next area. Nothing out of the ordinary is shown throughout this short build, rooms full of enemies connected by tunnels full of enemies, with a short stop in a locked room to fend off waves of Thrall while Cayde-6 struggles with a lock. A sprint down a balcony lined with turrets controlled remotely by Cayde-6 is explosive fun, but the real moments of joy for me came from using the supers on offer. I’d already played as the Nightstalker during the Gambit hands-on preview, so I opted to use the Dawnblade Warlock in one run followed by the Striker Titan in another. The Dawnblade’s new ability is called Well of Radiance, and is easily described as a more-powerful Rift. Activating the super slams a massive sword into the ground and creates a huge area-of-effect that heals allies up to a complete overshield. This lasts an incredible amount of time, somewhere in the vicinity of 30 seconds, allowing for complete control of a large area. Unfortunately, I wasn’t able to inspect the subclass, so no greater details could be garnered about the other abilities on offer. As a Warlock-main, it’s hard to admit this new Dawnblade class tree felt somewhat underwhelming to use, but hopefully this can be chalked up to the early build. As for the Striker Titan, this could be the subclass that finally sees me playing a Titan more often than my Hunter. The new tree in the Striker subclass turns the Titan into a guided missile. Jumping into the air and activating the supers places the Titan in a “Superman pose” that should look familiar to anyone who played the original Destiny. Instead of just slamming into the ground, the Titan takes off to the sky and becomes completely controllable, able to be manoeuvred through the air while the velocity maintains. Over the space of several seconds, the Titan will lose altitude until it slams into the ground or until you physically aim at the ground and send it down to crush any enemies below with an explosion of arc power. I cannot understate how much fun this was to perform, to the point that I took around for a few minutes to let it recharge again. Also on display was the new weapon loadout system, allowing me to equip a sniper rifle in my primary slot and a sniper in my secondary. Though I was useless in close range encounter, this is simply a testament to Bungie letting players do what they want with their weapons. Want to ammo-choke yourself? Use three shotguns. The Trinity Ghoul made another appearance, so I took the opportunity to look at it a bit closer outside of the hectic Gambit multiplayer mode. The Exotic bow fires three arrows normally, but charging it fires a single arrow that, when it lands as a precision hit, makes the next shot chain lightning to nearby enemies. It really completes the power fantasy of being a Hunter, jumping around hunting things with a bow and arrow. One interesting thing I noted was that Cayde-6 sounded odd, to the point where I had to stop and really listen. I wasn’t able to confirm anything, but were I a betting man, I’d wager that Cayde-6 is no longer voiced by Nathan Fillion. It sounded like someone trying their best to sound like the Cayde-6 I remember hearing since 2014. There’s no telling whether this is simply a peek behind the curtain of video game production, whether Nathan Fillion was ill during the takes, or if someone else is voicing the lovable Exo robot from here on out. Upon reaching a climax, the demo ends, and I’m treated to a cutscene that features Cayde-6 on the ground, ragged and gasping for breath, while Prince Uldren stands over him, Ace of Spades in hand. With a final word to Cayde-6, the prince fires a round that kills the Exo, and sets forth the entire wild west revenge story of Destiny 2: Forsaken. 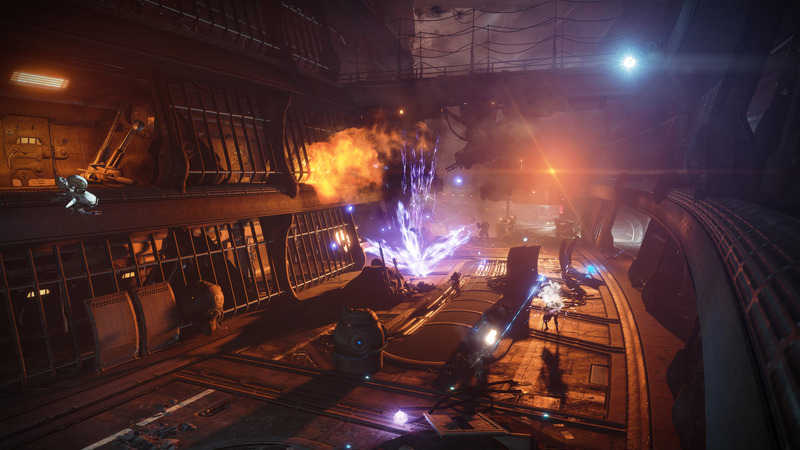 Though Destiny 2 seemingly struggled with the tone of the story at launch, the game looks to be shifting to a much darker and sombre atmosphere for Destiny 2: Forsaken, which launches on September 4.